Bentota is Sri Lanka’s luxury beach at the south-western coast. Bentota and the nearby beaches of Aluthgama and Beruwela have a reputation to be Sri Lanka’s No. 1 destination for water sports and fun activities. 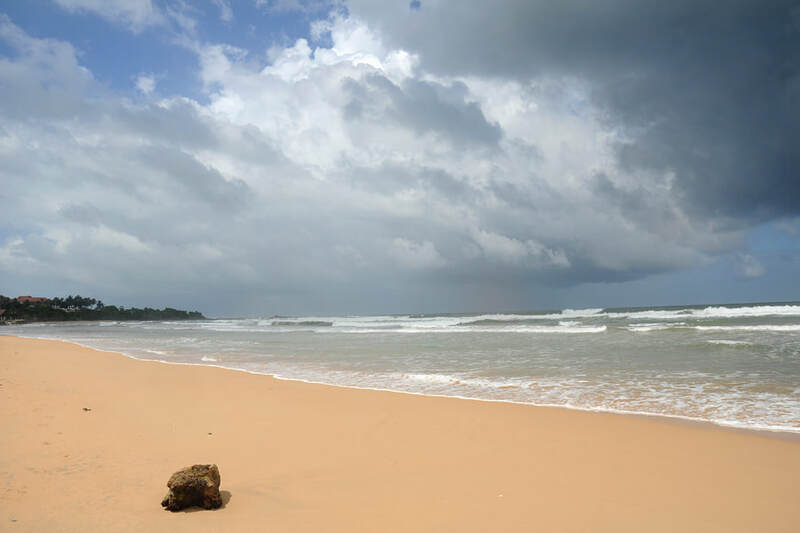 The main attraction of Bentota Beach is, not surprisingly, Bentota’s beach with its very smooth sand, framed by palm trees, offering great sunset views. Besides Sri Lanka’s best water sports, popular with Indian guests in particular, Bentota is also a centre of Ayurvedic treatments, a superb way of holiday relaxation Sri Lanka has to offer. Bentota river is worth to be explored on a boat trip. Moreover, there are other river mouths and wetlands not far from Bentota. The less brackish lagoon of the Madu Ganga river mouth is Sri Lanka's second largest wetland, famous for its 32 islands. Exploring the natural habitat of aquatic animals and waterbirds, you can visit the local markets and handicraft shops on the way. The Marine Turtle hatchery in Kosgoda, situated 11 km south of Bentota, has become a popular destinations for guests of Sri Lanka’s southwestern beaches. The Kosgoda turtle Farm is a conservation project to preserve endangered marine turtle species. Five of the world’s seven species of marine turtles come ashore to nest in Sri Lanka. The Kosgoda hatchery buries turtle eggs in sand after locals collected them to save them. The baby turtles hatch about 50 days afterwards, they will be released into the ocean at night. There are two landscape gardens in the vicinity of Bentota, designed by the brothers Bevis and Geoffrey Bawa. Brief Garden is situated 10 km further inland from Bentota. The Brief Garden, covering 2 hectares, combines local and English and Japanese landscape garden traditions. It was created 1929 as rural retreat of Bevis Bawa, elder brother of Sri Lanka’s most famous modern architect, Geoffrey Bawa. A small art museum is integrated in Bevis Bawa’s former garden residence. Lunuganga Estate, situated on a peninsula in Dedduwa Wewa 5 km southeast of Bentota, is the landscape garden of Bevis Bawa's younger brother Geoffrey Bawa, who was Sri Lanka's most famous architect. Lunuganga was inspired by Brief Gardens, but differs in many respects. The surrounding waters of the lake, a central lawn and several separate garden houses and pavilions are the predominant features of Lunuganga Gardens. The Beruwela Lighthouse tower is one of four international lighthouses of Sri Lanka. It is located on Barberyne Island. Boat trips to the island lighthouse take about 10 minutes one way. A circular gravel path will lead to the lighthouse on a hillock 15 m above sea level. 140 steps lead visitors to the top level, where they can enjoy a panoramic view of the entire southwestern coastline of Sri Lanka. Toddy is a palm wine created from the sap which is collected from the cut flower of the palm tree. As palm trees are growing high and a little bit apart from each other, toddy tappers transfer themselves from one treetop to another on tied ropes high above the ground. It seems to be an acrobatic kind of job, indeed, it’s a dangerous way of earning one’s living. However, watching toddy tappers doing their work is simply breath-taking. There are many opportunities to find toddy tapping areas along the southwest coast of Sri Lanka. Meetiyagoda, located between Ambalangoda and Hikkaduwa, but further inland, is prowd to have the “world’s only moonstone mine”. Indeed it is one of the very few places where moonstones are found in such high concentration. You can see the deep, narrow shafts of the mine. A small information centre and a large shop are attached to the mine and welcome visitors. The new giant Buddha statue of Kande Vihara is built on a vast elevated flat platform, which is an artificially widened natural mound. The huge Seated Buddha is situated in only 4 km distance from Bentota, not far from the town of Dharga. The statue built in the early 21st century 49 m high. It is displayed in the classical gesture of meditation, Samadhi Mudra. The platform of the temple complex is also attractive for its vistas to the lush green lowlands. The ocean can be seen at the horizon. Kandy Vihara is a recommendable sunset point. The ancient Buddhist temple called Benthara Galapatha Vihara is located in only 4 km distance from Bentota Beach, situated on a rocky plateau overlooking the Bentota river. Its stupa is believed to shelter a tooth relic of a famous disciple of Buddha, Maha Kassapa, who was the leading Buddhist figure in charge of the Sangha after the passing away of the Buddha. Today’s temple buildings are from the Kandy and British colonial period. Two traditional image housee contain an 8 m long sleeping Buddha and numerous coloured statues. An unusual feature of the Benthara Galapatha Vihara is a kind of natural stone filter, which is called “Galperanaya”. It is a porous oval basin, filling it with dirty water, puter water drops to the bottom basin after a few mnutes. Beruwela is within tuktuk driving distance, just north from Bentota at the opposite side of the Bentota river. Beruwala is a commercial fishing harbour and was once the island’s major seaport for international Muslim trade in the Indian ocean. Beruwala is proud to be a traditional centre of Sri Lanka’s Muslim minority. The best time to visit the harbour is the early morning between 6.00 and 7.00 am, when the night fishing boats return and sell fresh fish directly. Kechimali mosque in Bentota’s neighbouring town Beruwela is Sri Lanka’s oldest Muslim house of prayer, since Beruwela is the first recorded entrepot of Muslim traders in Sri Lanka, who visited the island from the 8th century onwards. The Kechimalai Mosque is built near their medival port. A muslim saint was buried at the site of this mosque in the 9th century. The Kechimalai Mosque was renovated by the British as a gift to the strong Muslim community. Till the present day, Beruwela is regarded as a centre of Muslim culture on the island of Sri Lanka.